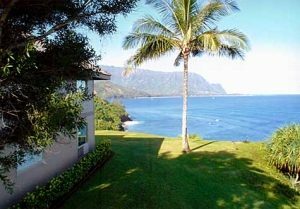 Nestled at Ocean’s Edge in the Exclusive Resort Community of Princeville – Featuring a Truly Spectacular Setting on the Lush North Shore with Dancing Rainbows & Towering Waterfalls – your own Vacation Condo Hideaway Awaits on the Magical ‘Garden Isle’ . . . at the Dramatic Pali Ke Kua. With the Emerald-Blue Pacific right outside your Door, you’ll Savor Spectacular Ocean Vistas and Dazzling Sunsets . . . Framed by World-Famous ‘Bali Hai’ and the Breathtaking Na Pali Coastline . 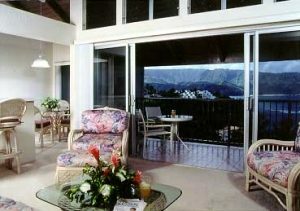 . . from the Private Lanai of your own Beautifully Appointed 1 or 2-Bedroom Oceanfront Kauai Vacation Condo Rental. As the Sound of the Crashing Surf Beckons your Call – In a Breathtaking ‘Postcard’ Setting overlooking World-Famous Hanalei Bay – you’ll appreciate the Deluxe Appointments of your North Shore Vacation Condo Rental Decorated in an Island-rattan Motif. While Marveling at another Spectacular Sunset from the Privacy of your own Spacious Lanai, amenities of your Vacation Condo Hideaway Feature Fully-Equipped Kitchens, In-Suite Washer-Driers, Vaulted Ceilings (many units) and TV’s/VCR’s. For your Added Vacation Pleasure, Explore our Private Secluded Beach – Featuring Fantastic Snorkeling . . . Enjoy a Refreshing Dip in the Pool . . . then Relax in the Whirlpool. Additional amenities showcase on-site Dining (dinner) and adjacent World-Class Championship Golf with Preferred Guest Rates. Additional Restaurants & Shops are just Moments away. Explore the Magnificence of the Lush North Shore . 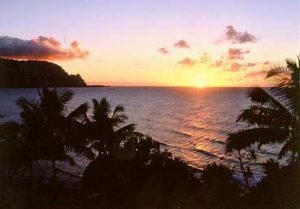 . . showcasing such Natural Island Wonders as Hanalei Bay, Lumahai Beach and the Na Pali Coast . . . In a Glorious Setting of Towering Waterfalls and Dancing Rainbows . . . From your Own Deluxe Vacation Condo at the Dramatic Pali Ke Kua (you’ll never want to leave! ).